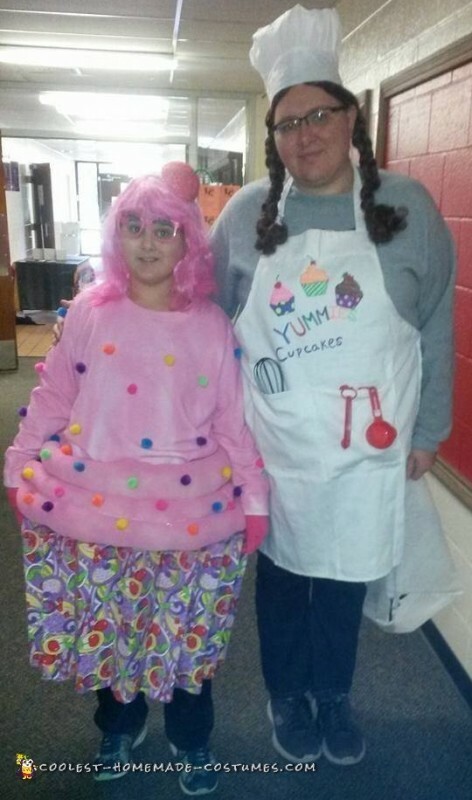 Here’s what I used to make my pink Shopkins Cupcake costume: Toy storage tub, white pantyhose, polyester stuffing, Poster Board, 1 1/2 yard of fabric, bubblegum pink fabric spray, pompoms, Gorilla hot glue, suspenders, White sweatshirt, Headband, Styrofoam half, red marker, green pipe cleaner, duct tape, spray on glue. I cut out the bottom of the toy tub. Then, I lined the edges from where I cut bottom of with duct tape. So when putting it on you wont get cut. I accordion styled the poster board. Then used spray on glue for the fabric on the board board following the creases. When finished I hot glued the poster board to the toy tub making it look like a wrapper. I cut off the top part of the pantyhose just keeping the legs. Each leg I stuffed with stuffing but didn’t make it stiff so the tube would be bendable. At the end of each leg I tied it shut. Once I got through 2 pairs of pantyhose I tied them all together and each end I hot glued the ends together making 1 long snake. I took the snake and hot glued it to the frame of the tub then spiraled it up making it look like frosting. After I got the frosting on I took the bubblegum pink fabric spray and sprayed it looking like it was airbrushed on. I took the white sweatshirt and sprayed that with the bubblegum pink fabric spray to match the frosting. I took pompoms and hot glued them in random spots to look like sprinkles. Finally, I colored the Styrofoam red with marker and hot glued it to the pink head band to look like half a cherry on top. I topped costume off with pink wig and pink see through glasses with eyelashes.